I haven't seen Justice League yet, but no one seems to have much good to say about it - other than the CinemaWins guy, but his level of awesome positivity is truly superhuman. Still, you have to give them credit: they really tried their hardest to copy the success of Avengers, including poaching its director and most of its plot. Originally from a planet called Apokolips, the Parademon troops will launch an attack on the planet of catastrophic proportions. So, Avengers: an alien being wearing a pointy helmet leads his generic, faceless army of robo-bug monsters to Earth to conquer it in search of a powerful cube. And Justice League: an alien being wearing a pointy helmet leads his generic, faceless army of robo-bug monsters to Earth to conquer it in search of three powerful cubes! I was wrong, Justice League is totally a unique experience! 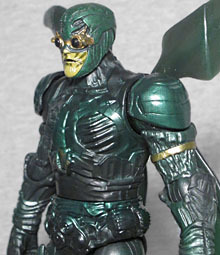 The cinematic Parademon at least makes a token effort to look like the comicbook version, with its green-and-yellow colorscheme and the goggles covering the eyes. Heck, even the puckered skin around the exposed mouth can be read as a parallel to the "real" look. No one would ever mistake this for a classic Parademon, but it's identifiable. It's interesting, however, that while Thor: Ragnarok is over there just straight-up putting goofball Jack Kirby designs on the movie screen, DC is still trying to prove how mature and serious they are by creating over-designed armor that really doesn't look like anything at all. The suits have chitinous plates and ribbed sections, but it all just blends into a visually muddled pudding of nothingness. Of course, crisp detail is not Mattel's strong suit, so the design loses even more info in its translation to a toy. There's certainly lots of attempted detail in the sculpt, but the execution is typically lacking. It might have helped if the Parademons had more color. 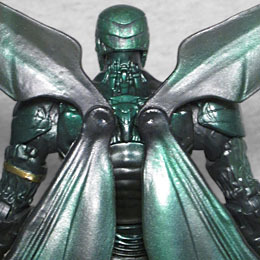 Kirby's Parademons were green with lots of bright yellow armor to break up the shapes; the movie's are green on green on green. Under the right light the flat green and the metallic green are easy to differentiate, but for the most part them look the same. The only bright spots are the paler green flesh, and the gold used for the goggles and the band around the left arm. And the wings on his back are translucent, in theory, but the green paint on them is so thick that you have to have a light directly behind them before you can tell. No surprise that the articulation is lacking. The Parademon moves at the ankles, knees, thighs, hips, waist, wrists, elbows, biceps, shoulders, neck, and wings. The feet are molded weirdly, so they both tip to the inside, and since there are no rocker joints there, they'll never rest flat on the ground. The elbows, for some reason, are swivel/hinges, but the swivel part is in the forearm, not the upper arm, meaning the range of motion it provides is the same as the wrist swivel, and thus entirely pointless. And you just know that the head will only swivel, not raise up or down. The Parademon is armed with a large Apokaliptan rifle he can hold in his right hand. The aiming leaves a little to be desired, but at least he won't drop it? This figure is a Toys Я Us exclusive, an extra add-on to the Justice League line, so it doesn't include any BAF parts. 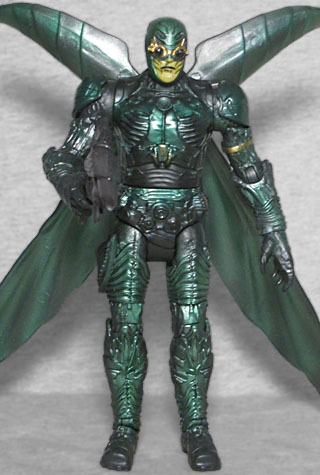 The Parademon, as shown on the back of the box, uses a much brighter palette that makes him look more recognizable. But the final figure is just as drab and formless as the movie it came from. The toy was released just before TRU's future went to hell, so he's not easy to find, but he's not impossible, either. 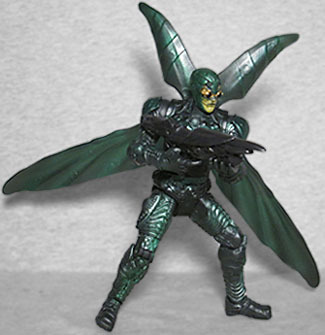 And though the toy may not be great, it's nice to get a third style of Parademon to add to Darkseid's army.